Hard to believe that Osama Bin Laden has finally been killed. Between the rain and the news, sleep was in short supply last night. This is going to be a long cold day. I wonder who will get to play the shooter in the movie? Chuck Norris is to old, The Rock may be busy making a Disney movie, and Brad Pitt is so 2000's. I nominate me. The Tigers season ended Friday night. Saturday, past Terrell greats came back to take part in the annual Tiger Alumni Game. Here are a few shots from the game. 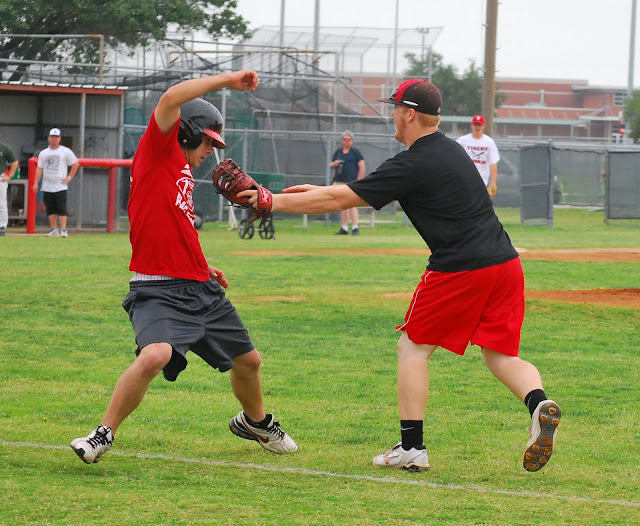 More can be found on the Terrell Daily Photo Facebook page. Its a new month, please give the Terrell page on iHigh a visit. While Terrell's season has ended, the playoffs are just beginning for Mesquite Poteet, Forney, Red Oak and Waxahachie. Waxahachie earned their playoff spot by ending Mesquite Poteet's 59 game district winning streak. The year is not over for all of the Terrell athletes. Three Tigers will travel up to Denton today and tomorrow to take part in the Class 4A Region II Track and Field Regional. They will be attempting to earn a spot in the State Meet in Austin, TX on May 13th & 14th. Representing Terrell will be Teira Hill in the long jump and triple jump, Lauren Randolph in the shot put and discus and Cornelius Horn in the 400m run. In 2009 Aron Garcia won the State Girls 4A High Jump Championship representing the Terrell Tigers. Looking for the results from the 2011 Terrell Heritage Jubilee BBQ Cook-off? The International Barbeque Cookers Association has them here. Terrell has an election coming up. One of the issues we are voting for or against is a Rental Community Integrity Ordinance. Has anyone ever heard of www.75160.com? There seems to be a lot of discussion on the election at that site. I have never heard of it, but will check it out today. Here is a new video from a Dallas based band Free Reign. Two of the members of the group are Dallas Cowboys. Parts of this video were filmed at Thrillvania Thrill Park located in Terrell.